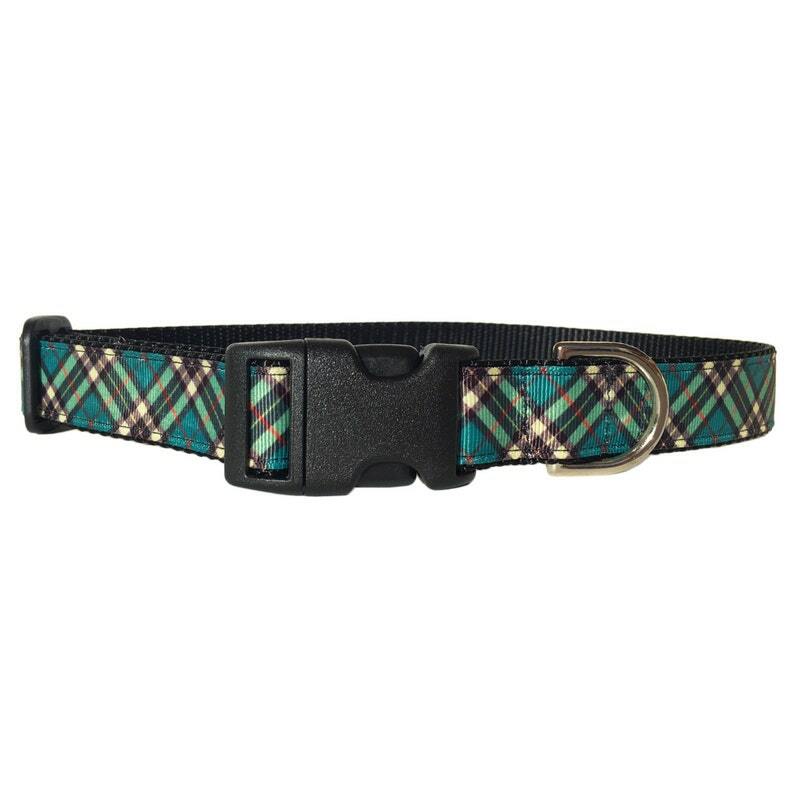 Polished and sophisticated, this plaid dog collar is made with a 1" green, tan, teal grosgrain ribbon featuring a tartan pattern that is attached to 1 inch black heavy-duty nylon webbing using interfacing and high-quality thread (triple sewn on pull-points). The hardware is plastic (a contoured, quick-release buckle and slip-lock) and a nickle D-ring. If you need the collar in a different size - please contact me and I can create a custom order for you. Also contact me if you are unsure of which size to order and I can help you pick the best fit. All collars are handmade as they are ordered, so there may be a wait time of up to 7-10 days before your collar is shipped. If this is a problem and you need to get the collar sooner, please contact me before purchasing the collar and I will let you know if I can get it to you sooner. My yellow lab, Shandy, loves her new Valentine's Day collar. The sizing is accurate, and the quality is very nice. We would purchase from Nifty Pup again. This collar is super cute and looks adorable on my yellow labrador retriever. The only thing is that the polka dots started to peel off after a few weeks. Other than that, the collar has held up really well. Great purchase! Looks so pretty on my chocolate lab! I accept PayPal, Credit Card, and Etsy Gift Cards. I will do everything possible to ensure that you are satisfied with your purchase. If you are not completely satisfied with your purchase, items may be returned in their original condition within 10 days of customer receiving item (showing no signs of wear and/or tear), and a full refund will be given. * If you would like an exchange because you ordered the wrong size, color, or style or you have decided you would prefer a different item-- a shipping fee will be added to the exchange. * If, however, the mistake is due to a misunderstanding/miscommunication at the fault of Nifty Pup, all shipping costs will be waived. * Items being exchanged must be returned in their original condition within 10 days of customer receiving item (showing no signs of wear and/or tear). The new items will be shipped to the buyer upon receipt of the original purchase and acceptance of their condition. Refund and Exchange policies for Custom Orders will vary depending on the order and will be made clear to the buyer before purchase. USPS shipping for each order, unless prior agreement with seller. Added amenities such as insurance and/or confirmation will be available, but additional fees will apply to buyers' final cost. Each product is handmade, please allow up to 7-10 days before items are mailed to buyer. If item is needed sooner, please contact Nifty Pups, and I'll try to accommodate, if possible. Upgrades (Priority and Express) are available for most items at an additional shipping cost. All customs fees are the responsibility of the buyer. For legal reasons, these fees cannot be included in the purchase price and must be paid by the buyer. Wash your dog's collar by hand in the sink, using 3 cups of water to 1 cup of vinegar. Vinegar will clean and disinfect the collar without leaving behind irritants that will bother your dog's skin. Soak the collar for 10 minutes, then rinse. Allow to air dry before putting back on your dog. Never put a collar in the dryer to dry it, as it can warp the collar.